Nobody’s going to believe that someone with your refined sense of style could ever wear something as despicable as a coat made from Dalmatian puppies. 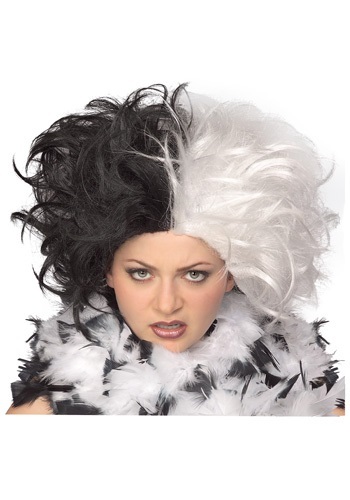 That is, unless you show them your true stripes by wearing a Mrs. Spot Wig like this! If you were more of a fashion dilettante, maybe you’d just call the whole thing off. But we’re guessing that the part of you that loves the glamour of haute couture is clamoring for the spotlight. And if you want to build the kind of notoriety that you can only get from playing the villain, you’ve got to look the part. So no matter how sensible your outfit may be, the Dr. Jekyll & Mr. Hyde part of this black-and-white wig will suggest to people know that you’re not just a well-dressed lady. There’s something far more sinister to your character buried under all that fur! Excellent, quality, lush wig! The picture has it ratted-out, but it arrives smooth and crazy, which is exactly how I wore it. Either way, it will not fall apart, and is easy to work with. This is the first time that I ordered something like this online so I was a bit nervous but I was thirlled when it arrived. It was exactly what I was hoping for!